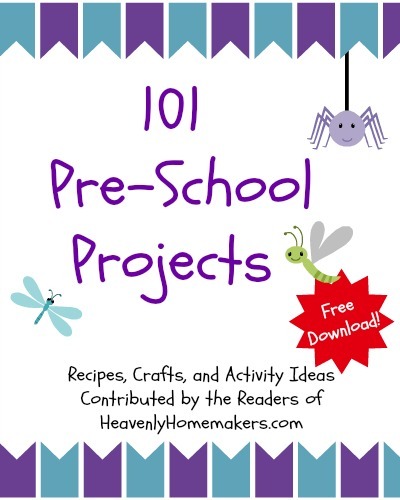 Two years ago, we put together 101 Pre-School Projects ebook. All of the ideas in the book were contributed by Heavenly Homemakers readers – smart and creative people that you are. The book is loaded with over 100 fun and inexpensive ideas to use with your young children. There are loads of summertime activities in the book. It occurred to me today that many of you might not be aware that we have this FREE resource in our Heavenly Homemakers Shop. I decided I’d better remedy that and tell you about it! 101 Pre-School Projects is free, on the house, complimentary…and it also doesn’t cost anything. Go download your free ebook and learn all kinds of fun activities to do with your kids! Thank you for sharing so many great ideas with us! perfect timing as our summer is in need of inspiration!